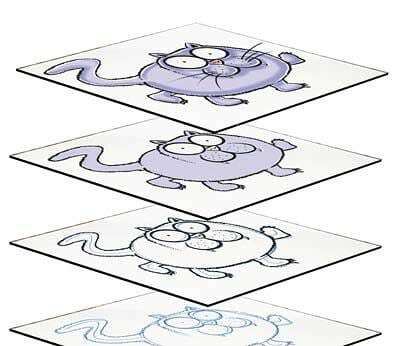 The cartoon cat above was drawn in photoshop in stages in five different layers ranging from the basic pencil sketch up to the finished full color cartoon. The layers in between are where finer detail, color and thicker line is built up. 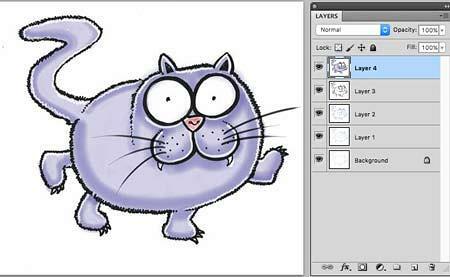 Inside Photoshop is a layers pallete on which you can build up layers of images (see the image at the top of the page which shows the pallet to the right of the cartoon cat). To activate the layers pallete (if it is not already visible) click on the ‘windows’ tab at the top of the screen when photoshop is open and select ‘layers’ from the drop down menu. The pallete will appear and can be moved around the screen by clicking on it and dragging with the mouse. Think of each ‘layer’ as a sheet of glass. 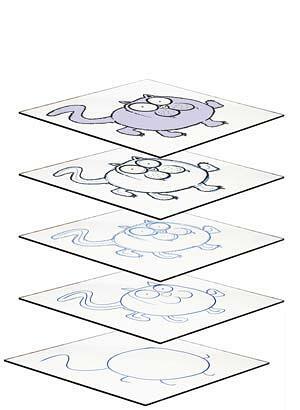 There were 5 sheets one on top of each other in the cat cartoon. You can adjust the opacity of each layer which enables you to see through them. This allows you to create a base sketch. Then see it through the layer above and make improvements, adding detail and color. Quickly you improve and develop the cartoon into the finished drawing. The main advantage of drawing with layers on a graphics tablet over drawing on good old paper is that you have far more control and can use effects that you could never achieve on paper. If you splat ink over your paper artwork it is probably destined for the trash bin. If you make a huge mistake in layers or don’t like the result you can backtrack and go over a section again. You can create text layers, shading layers and duplicate layers. Imagine trying to draw a swarm of bees on paper. It would take a fair bit of work and time. In photoshop layers you could draw half a dozen bees then duplicate the layer and resize each one as many times as you like to create a huge swarm in minutes! Layers can also be used in the same way as a lightbox to trace photos or other pictures and artwork. By placing the original image on a layer you can trace the image on the layer above. Simple but very effective. As you can see the use of layers in photoshop has some really powerful features and benefits that can make drawing a sheer joy! What are the disadvantages of drawing on layers in Photoshop? You have to possess the software and a graphics tablet which costs money. The full price of the latest Photoshop software can be quite pricey. However the cutdown version, Photoshop Elements has the tools you will need to create great artwork including the layers feature and costs a great deal less. You could buy one of Wacoms recently launched basic tablets with software included for under $100 – a great brand with superb software thrown in. Electronic art is not done with a pen and paper and some artists can’t give up the physical interaction with ink on paper. This is down to individual taste and only you can decide. Where can I buy graphics software such as Adobe Photoshop, photoshop elements and Sketchbook Pro? You can buy directly from the Adobe web site or from Amazon – see my article on Photoshop Elements 14 for more information… If you are about to get into graphics tablets and graphics software it will be an uphill struggle to start with just to get to grips with the software itself. However once you are over that hurdle (and there are plenty of Youtube videos and other resources to get you on your way) the rewards are amazing!